The Nest Cam Indoor is okay, we supposed, if you don’t mind paying $200 for a camera that just sits there. 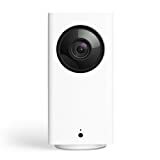 Here’s another option: pay $38 for the Wyze Cam Pan 1080p Pan/Tilt/Zoom Wi-Fi Indoor Smart Home Camera. While the Nest Cam can see only what’s in front of it, the Wyze Cam Pan rotates 360 degrees so it can see every inch of a room. It even has an awesome motion tracking feature that automatically follows movement, as well as unprecedented 14-day cloud storage for free! 3.5mm focal length. F2.3 aperture. 120º wide angle lens. Enhanced 1/2.7″ CMOS sensor.